Nazarbayev University: the Oxford of Kazakhstan? Sorry for the silence since the last post (I try to post once a week) – I have been using all my spare time to complete a full draft of my Tajik study abroad paper. Given the wealth of information I received, you can imagine that it has taken some time to analyse all the data and then translate that into findings for the paper. I will post some of my initial findings soon, and welcome comments and feedback (preferably by the end of March when I have to submit my final paper!). Today’s post is about a university with grand ambitions to become the Oxford (or Harvard, or Cambridge – post in your own analogy here) of Kazakhstan. I’ve been following the rise of Nazarbayev University (NU) for a while now, and my fascination for its radical mission is ever growing. Why is the mission radical? Well, have you ever come across any other university with so much state support (not just funding but also other forms of support, such as a commitment to academic freedom) that has declared that it will be world-leading in such a short space of time? For a first-hand account of NU’s ambition, it’s well worth reading an article by the University’s President Shigeo Katsu published in the UK’s Times Higher Education magazine in April 2011. Last summer, I had the privilege of meeting Dr Kadisha Dairova, Vice-President for Academic, Student and International Affairs at NU. She reinforced the importance of quality and research excellence to the success of the university, and outlined some of the partnerships that have already been established with the likes of Harvard, Cambridge, University College London, National University of Singapore and others to assist with the design and implementation of the first degree-bearing courses. a well-rounded personality: as Dr Dairova said, “just a good engineer will not make a good leader”. 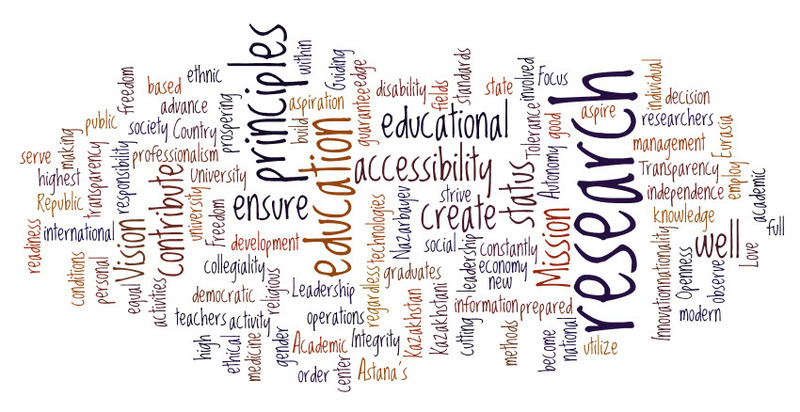 The diagram below highlights the most commonly used words in NU’s vision and mission: the larger words are the ones that appear most often. If you want to see what NU actually looks like, check out this report on President Nazarbayev’s recent visit to the main campus in Astana, capital of Kazakhstan. The report also features a video of Nazarbayev touring his eponymous university – including visiting a student room as further evidence of the university’s “all-mod-cons” attitude. In trying to emulate a university of Oxford or Harvard’s standing, NU is making significant financial investment (which also extends to a series of Nazarbayev Intellectual Schools which are designed to be feeders to the university in future) as well as devising high-level partnerships with international universities. But will this be enough to create the academic excellence that is demanded? This entry was posted in Kazakhstan, Uncategorized and tagged Higher education, Kazakhstan, Nazarbayev University. You can certainly find me on LinkedIn if you’d like to connect that way. I’m also on academia.edu. I’m very happy for you to link to my article as long as I am given author credit and the URL is included.